I recently had one of my doctors who is a prominent Beverly Hills surgeon and avid golfer ask me if an "older man, who is inflexible " should start a yoga program. He meant himself. In his early 50's and hardly " older “ although he may well be inflexible. I told him the same thing I tell everyone: Yoga meets you where you live … that means that no matter your age, sport, flexibility level, Yoga will assist you. Yoga is a process like any other process: healing, therapy or education. It gets better the more you do and you will see results. Yoga is beneficial for everyone. In particular athletes and people who are involved in any kind of sport or workout will benefit from the flexibility, strength and balance that yoga brings. Consistent body movements such as we do in any sport, create habitual tightness in our muscles, tendons and ligaments. Yoga is the perfect complement to release tension, tightness and stress from the body/mind. Yoga will up your game, whether it’s the game of life or football. "Yoga meets you where you live." For the past twenty years, I have had the pleasure of teaching yoga to thousands of people around the world who teach to thousands of people; YogaFit's ripple effects have touched millions of lives on planet earth. YogaFit®, born in the fitness industry in 1994 has changed the lives of millions and built the yoga market around the world. YogaFit® is a conscious business dedicated to improving health, performance, and mental acuity; increasing fitness awareness and availability; giving back to the community; and expanding that community on global terms. YogaFit® brings yoga to the masses. If we look at the statistics in the United States , only ten percent of the population, some 30 million people, belongs to a health club; only half of them, 15 million people, are doing yoga. This number is growing rapidly because yoga works. Most sports teams have caught on to the benefits of yoga, from high school teams to NFL professionals. Take this as a personal challenge to start your yoga practice. Yoga is a gift of the body and the mind, and my intent with YogaFit® continues to lead the way toward fitness, conscious business, and karmic responsibility. My goal is to continue to spread the power of yoga. I work with members of the NFL and referees and I have seen over the course of time the improvements that yoga brings to athletes. The word yoga means to yoke – to bring together, union and the joining of opposing forces. What does that mean to an athlete or sports minded person? It means you can balance your body from training, sports and exercise. It means you can train longer, harder and smarter. It means you will have greater longevity like the NFL officials I work with whose average age is 55. Through breathing exercises you will learn to reduce stress and gain calm. "Any yoga practice is a good practice, as long as it is safe." Whether sport is the way you try to stay in shape, a relaxing/indulge-yourself hobby or a pastime that you may hope to take professionally one day, you’re an athlete. It doesn’t matter what level of sport you engage in or aspire to: a morning jogger or a marathoner, a weekend warrior or a US Open contender, a reliable tennis partner or an intense competitor on the club ladder, you’re an athlete. You have a sport you’d call your “thing?” You’re an athlete. The word "athlete" is a Greek derivative meaning one who participates in a contest that involves physical strength, speed, and/or endurance. But being an athlete involves more than competing in an event. It is a commitment to a craft, focusing both mental and physical energy to honing a skill, developing a healthy and strong body, and always striving to become better…to become the best. What’s the difference then of being an athlete and being someone who is athletic? I've been very active since childhood, participating in swimming, running, weight training, tennis, hiking, walking and yoga. I have never been a competitive athlete, however I work with professional athletes and coaches for the NFL among other leagues. I believe being an athlete is a LIFESTYLE. I live my life like an athlete, and it shows. I am also athletic in the way I commit myself to my physical refinement and mental health. I make physical activity the true focus of my life because any day that I am not active, I feel despondent, depressed, and just "off." I eat for energy and plan my day purposely so that it involves exercise. "I like to think that WE ARE ALL ATHLETES." Through learning and practicing meditation, you will enjoy greater focus, improved performance and less stress around competing. When you incorporate visualization into your life you will create the winning results you desire. When you learn “transformational language" you will start to communicate with yourself in a more positive way. Positive changes add up just like negative ones do, Yoga in all its many forms will create positive change. By adding even a handful of helpful poses you will truly up your game. My life, like so many of you, is a race, and in this “game of life” I commit as an athlete would: being in the best possible condition to get through it. When you consider that working, caring for your children, being a good partner and friend, and taking care of your pets are all enhanced by you BEING YOUR BEST YOU, then you will want to live with the strength and dedication of an athlete. You will want to live the athletic lifestyle. Imagine if we all lived our life like athletes- we would make our health our number one priority; commit to being fit and ready for action; use food as fuel and not a vice; refrain from behaviors (like smoking and drinking) that take ourselves away from being healthy; work out regularly; strive for goals, purpose, focus and discipline; and use mind body techniques (like meditation & visualization) to achieve success. "An athlete's well-rounded health regimen brings them resilience and vitality throughout all aspects in life, not just their sport." Making your health your number one priority means you care for yourself, and people who have managed to make long-term lifestyle changes have all, in one way or another, found their "inner athlete." When you identify as an athlete it gives you more of a desire to stick with your exercise routine, make healthy lifestyle choices, eat well, and get rest. An athlete’s well-rounded health regimen brings them resilience and vitality throughout all aspects in life, not just their sport. Athletes eat and train, rather than diet and exercise. Building a sound health regimen for yourself helps navigate out of the unhealthy, unhappy, and unfit version of yourself and helps master the most difficult yet most malleable and rewarding thing in your life – your physical and mental self. I'd like to think that WE ARE ALL ATHLETES, and I encourage you to define yourself as an athlete to improve your overall lifestyle and physical/mental well strength. This doesn't mean you have to run a marathon or be a power lifter, but you may start to get much more competitive with yourself and truly care for the beautiful body with which you have been gifted. If you are not an elite “athlete” by definition, then how do you apply yourself as an athlete? Think for a moment about how you spend most of your time- Is it at work? With your family? How do you present yourself in daily situations? Chances are you want to perform at an optimum level and strive to be the best. If you show up healthier, more focused, and more present in any place— you will win. In all senses of the word. View your physical endeavor as a way to show up at your prime: on the court or in the boardroom. 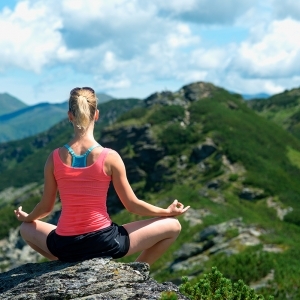 "If you show up healthier, more focused, and more present in any place—you will win." Physically, as an athlete you generally commit yourself full time to daily practices, whether it’s on the field with a team, in the gym with a trainer, or in rest and recuperation. You work out regularly to gain muscle and stamina, to prevent injury, and of course, be better than the next so that you can win. Because competition at all levels requires a fine-tuned commitment, many athletes train throughout the year to maintain excellent form, technique, and peak physical condition. The fact is training tightens up your body, and it’s crucial to find a balance and a way to release the strain and tension in your muscles. Often, strenuous training engages an imbalance of opposing muscle groups whereas yoga concentrates on balancing this activity. Yoga enhances alignment, balance, core stability, strength, flexibility, agility, endurance, as well as mobility. Yoga stretches muscles for greater flexibility, and strengthens the core and smaller attachment muscles for sports, which improves form and leads to an economy of movement that heightens performance significantly. It deepens your lung capacity which helps sustain a steady breath during physical activity, while also slowly and consciously stretching your muscles to prevent injury. Athletes who are not practicing yoga are competing at a disadvantage and missing an opportunity to create peak performance, as well as longevity. When yoga’s many benefits become part of your lifestyle, your life will change for the better, and so will your game. Mentally, an athlete requires acute concentration and focus. The mental devotion of an athlete is a full-time job, and to commit daily to a very specific regimen is not easy. It takes mental balance to understand the importance of a well-rounded practice and diet, alleviating the pressure of being the best and winning, focusing in the moment to make the right move and tuning out the surrounding noise that distracts you. Yoga, in all its many forms, will create positive change even in your mind. 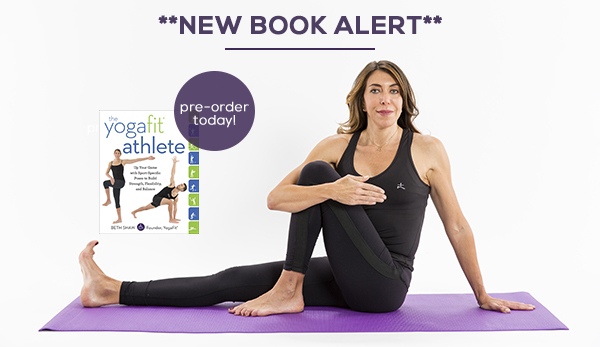 The YogaFit® Athlete teaches meditation for greater focus, improved performance and less stress from competing. Visualization also comes into play so that you create the winning results you desire, while “transformational language” will help you communicate with yourself in a more positive way. Positive changes add up just like negative ones do, and yoga will help eliminate the “noise” to clear the way for positive reinforcement in your life and sport. Yoga will up your game, whether it’s the “game of life” or your sport. Every day I am required to show up in prime mental and physical condition to do my job. I am an author, creator of fitness programming, and international presenter. I teach yoga, fitness, wellness and meditation, and am the founder of the largest yoga training school in North America, YogaFit®, which trains professionals to become YogaFit® and YogaLean instructors. For the past twenty years, I’ve taught the yoga lifestyle and principles to thousands of people around the world, and its ripple effect has touched millions of lives, bodies, and minds on earth. Since 1994, YogaFit® has built the global yoga market, impacting a multitude of people with a spectrum of physical and mental goals. Yoga is a gift and my intent with YogaFit® continues to lead the way toward fitness, conscious business, and karmic responsibility. My intent with this book is to impact you and your sport. 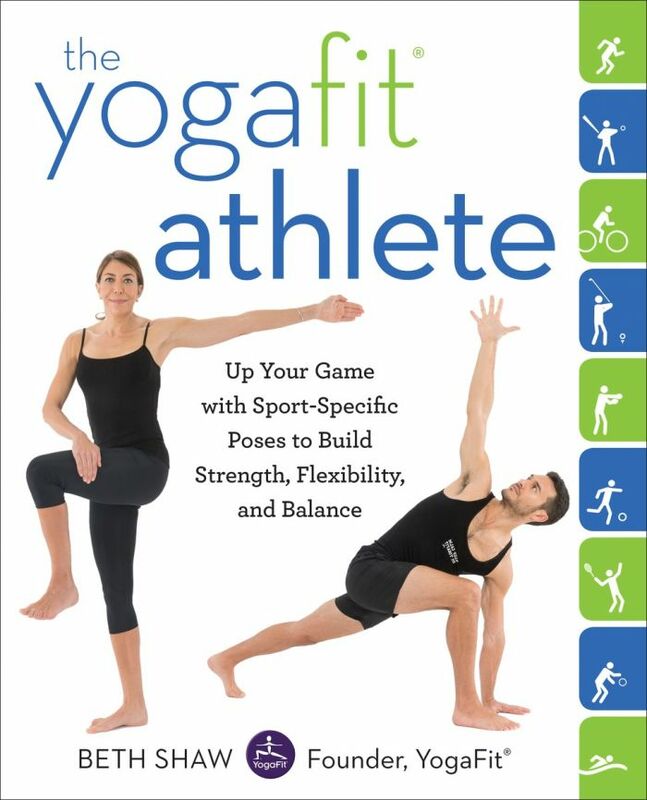 In this book, you will complement your sport with sport-specific yoga poses, which can enhance your performance ten-fold and reduce the risk of injury. As much as you spend time fine-tuning your swing or shot or general form for your sport, you are at the same time likely building up a “strong side.” Consistent body movements, such as we do in any sport, create habitual tightness in our muscles (often favoring one side), tendons and ligaments. Yoga is the perfect complement to release tension, tightness and stress, balance your strength and help create better balance overall, even in sports where a strong side is inevitable or even the point- like golf or baseball, for instance. Learn breathing exercises, physical (hatha) yoga postures, meditation techniques, guided imagery options and custom routines for each athletic activity. You will learn mental as well as physical training, with many options to create your own personal plan for success. Whether you compete with others or against yourself, yoga guides you to setting goals, developing focus and achieving your own personal best. Discover your inner athlete, with intention and purpose to improve your mind/ body health.